Hiya Everyone, Why suddenly has my best friend started to limp? I'm extremely worried about him as he seems very uncomfortable. He's let me thoroughly examine his hip, leg, foot, and nails and I cannot find any injury - I'm bemused at his sudden limping and trouble getting up and laying back down. He's always been healthy and happy with no problems with ears, eyes and hips and he's now 8 years old, I don't understand it! I've a very unhappy dog and I'm a very worried owner, so I would very much appreciate some advice and help for him...thanks again! My 5 year old cocker has suddenly became lame on his front left leg. I took him to vet on Saturday who thought ligament pain and prescribed Metacalm with an injection and medicine to put in his food daily. This is day 5 with no real improvement. He will let me touch his leg and paw with no obvious pain. Should I give him a bit longer to improve before returning to vet? Glad to hear Sweep's better! I am so happy to report my little fella is much better........yipee! It worked out quite well as I was decorating my living room so I made sure he rested on the settee for 2 days while he watched mummy strip wallpaper! It worked, because he's back to his usual bouncy self, I'm pleased to say, (you would never know he is 8 years old lol). We also had him shaved so we could properly examine his hips and knees and had his feet and nails checked, all of which were ok, so I think that you were right and he strained or knocked his knee. I'm so glad he isn't suffering from arthritis, I know how painful that is and I would be so upset if he was suffering with that sort of pain. What a relief he's better, I'm one happy owner and he's one happy dog. Thank you for all your advice on this, I was worried silly! Your cocker may have strained his leg, he may have accidently knocked it and it's bruised, or there may be a minor injury that you can't see because of his thick fur. The most common causes of temporary lameness are thorns, splinters, and broken toenails. You've checked this already, but are you certain there's nothing there? Has this happened before? If it's a regular occurance, it's probably best if you take him to the vet. What a gorgeous spaniel! He's so cool. 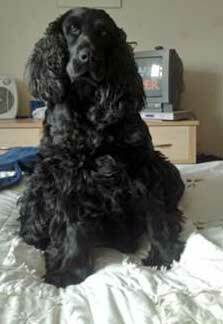 I recommend you take your cocker spaniel to the vet as it could be the onset of arthritis and he may be in pain. As he's eight years old, this is quite feasible.